Insurance firm Loews Corp. (L) saw its stock trade 1% down Monday after it posted second-quarter earnings that missed analysts estimates. 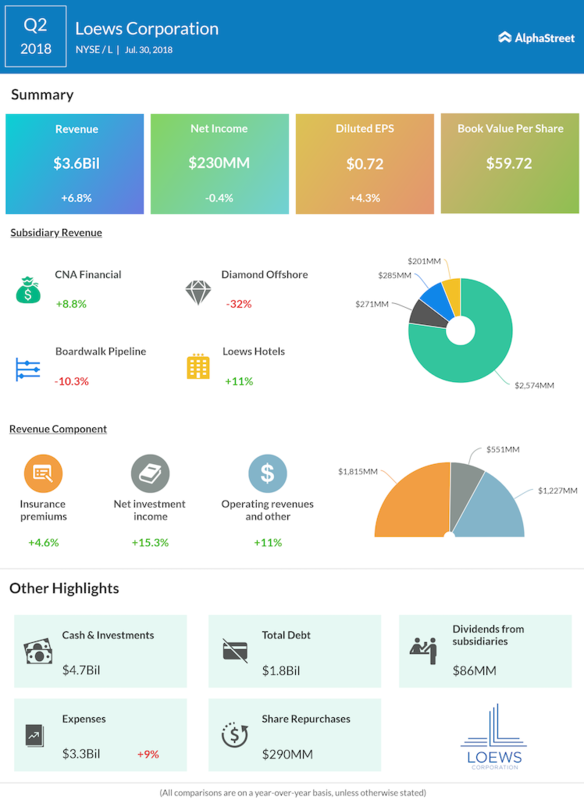 Net income was flat at $230 million, mainly hurt by lower earnings at Diamond Offshore Drilling, Inc. and CNA Financial Corporation. Meanwhile, EPS rose 4.35% to $0.72 per share, missing analysts’ projection by a cent. The increase in EPS reflects the share repurchase activity in 2017 and 2018. The New-York based company posted revenue of $3.59 billion during this period. Loews shares have traded relatively flat this year and has increased 3% in the last 12 months. Loews Hotels & Co’s, a small group with just 24 hotels, has been taking long strides to boost profit by intensifying its focus in the upscale market. During the quarter, Loews Hotels earnings increased to $17 million from $10 million during Q1 2017. This increase was due to improved results at several owned-hotels, primarily the Loews Miami Beach Hotel, slightly higher earnings at joint venture properties and the lower corporate tax rate. 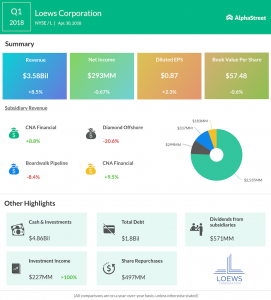 Diamond Offshore, in which Loews owns 53% stake, reported a net loss of $37 million compared to earnings of $7 million in the prior year due to unfavorable market conditions. This impacted both rig utilization and average daily revenue. 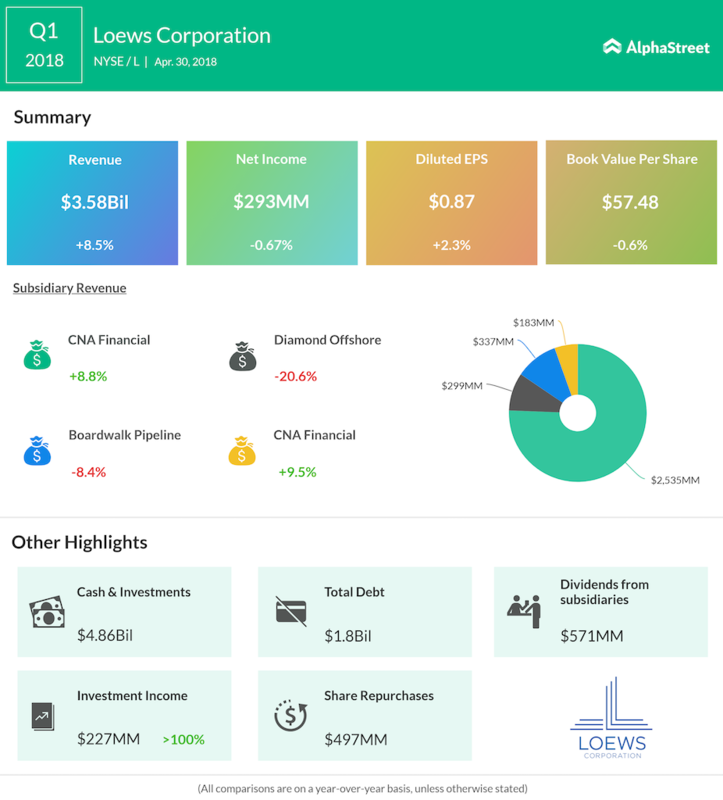 The company’s property and casualty insurance unit, CNA Financial (CNA), in which Loews owns 80% stake, also witnessed a decline in its earnings to $240 million from $244 million during the prior-year period. This decline was due to lower realized investment results and increased costs associated with the transition to a new IT infrastructure service provider.